"Personally I am no fan of teaching students to be always relaxed; during flute playing you need to control muscles. Control does not mean to straddle. Thus there are three things to aim for: stability, upright position and flexibility.... I am fairly relaxed not playing. But every physical activity needs muscles and a relaxed muscle is like a cracked spring." The lung , the respiratory organ, has no muscles of his own to use for active work in gas exchange. It reacts only passively on dilatation or contraction of the thorax. The stream of air is triggered by the pressure difference due to the change of lung volume. Thus the wind player has to reduce the resistance against this passive air flow. This means in clear words to open the respiratory system. Especially around the larynx and the embouchure are critical areas. The muscles involved in breathing are mainly the diaphragm, the muscles of the abdomen and the muscles between the ribs. At normal breathing, 60% of the gas exchange is driven by the diaphragm. The diaphragm is tense during inhalation and pushs the organs beneath down and to the front of the abdomen. As a result the abdomen is stretched in all directions and the thorax is expanded to the bottom and to the front. Vibrato is a continuous change of amplitude, frequency and/or colour of a tone. It is used to support melodic development. The vibrato is thus variied in respect to its speed and deflection. For the flute vibrato may be produced by the lips, larynx, shaking the flute or diaphragm. All types of vibrato besides the one managed by diaphragm are frowned upon nowadays. A scientifical study in 1991 showed that the diaphragm vibrato really is produced by the vocal chords. "Essential for a freed breathing is an upright posture, giving room for relaxed movement of all parts of the respiratory system. At the same time breathing also influences the posture. Most of the muscles part of the respiratory system are connected with the cervical spine and the lumbar spine. Thus breathing also has an influence on stability and position of the spine. At the same time the position of the spine affects speed and quality of breathing. Thus efficient breathing means correct posture and the other way round." Beside the interaction between posture and breathing, the main relevance of the posture for flute playing is the aesthetical impression of the audience. At the same time a wrong position leads to tensions which might negatively influence the fingers and the embouchure. In general the standing during flute playing should be flexible but stable. A basic stress is wanted. Some of the most common malpositions are a hollow-back and especially while sitting a reclined upper part of the body. In the last case often the arms are touching the body. Due to the flute held to the right, the flutist is slightly twisted. The head is turned left in direction of the mouth-hole. At the same time the legs are positioned in a slighly opened pace to the right (this means the left foot stands a bit in front of the right). The meaning of the little finger for the stability of the flutes, makes him part of fingerings where the use of this finger does not change the sound of the tone. The position of the fingers on the keys of the flute is shown in the picture beneath. The fingers of the left hand are printed in blue, those of the right in red. The letters are assigned to the fingers as follows: Z - forefinger, M - middle finger, R - ring finger und K - little finger. D for the left thumb shows about the position of the double key at the back of the flute. The right little finger uses all of the keys of the lower joint. The right thumb supports the flute approximately below the forefinger. The fingers on the keys are relaxed and fingertips rest without tension on the keys. The fingers are slightly arced all the time. For a stable position of the flute it is essential, that the keys are parallel to the ground (horizontally). Thus the fingers do not need to stop the instrument from turning round. To play seated, the pelvis should stand upright. Thus the upper part of the body is stretched and the breathing is not manipulated. Leaning back is only wise during breaks. For both sitting or standing, the left elbow should be lifted to give the thorax room to streacht during breath-in. Embouchure means the forming of the lips during playing. The lower lip should cover about one third of the mouth-hole. Changes in the size of the covered area of the mouth-hole lead to a different sound. The more covered, the more partial tones and less volume. If there is less of the mouth-hole covered, the sound becomes louder and has less partial tones. The flute should not be pushed with force against the chin to maintain flexibility of lower jaw and lip. In the middle of the lips there has to be a gap for the outgoing stream of air. One should not draw back the corners of the mouth like in grinning, because this would make the muscles tense and reduce the resonance room inside the mouth. One problem for a beginner is to hit the middle of the mouth-holes border with the jet of his breath. The best way to control aiming for students is to use a mirror. A second possibility is to control the position of the condensed breath on the mouth plate after playing. There should be a wedge in the middle, the pike showing away from the mouth-hole. The flute is very special regarding the resistance of blowing. Compared to reed instruments, there is nearly no resistance at all, as the breath is released to the environment. Due to the fact that pressure of blowing given by the breath support needs an antagonist, the embouchure has to provide the resistance. "Breath support is more like a feeling of the body or an attitude than like a technic to be learned. It is not a condition but an action." "As for a singer, the breathing of a flutist has to fulfill two requirements: absolute orderliness of the air flow (what is called breath support) and adequate capacity." Participating in breath support are the respiratory muscles and the embouchure, which try to maintain a constant blowing pressure together. It is a regulation process, which hast to be alloted exactly. 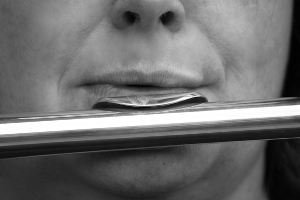 Regarding the organs and body parts involved, articulation in flute playing is analogous to articulation in talking active parts in articulation are for example the tongue, the larynx and the lips. An important influence on articulation has the native language of a flutist as well as the idiom he is used to. The initial state of the mouth during playing is similar to the pronunciation of the vowel "ö", as this is a position giving the lips enough space to form the embouchure. To start a tone, consonants are used. This might be b or p, t or d or g or k.